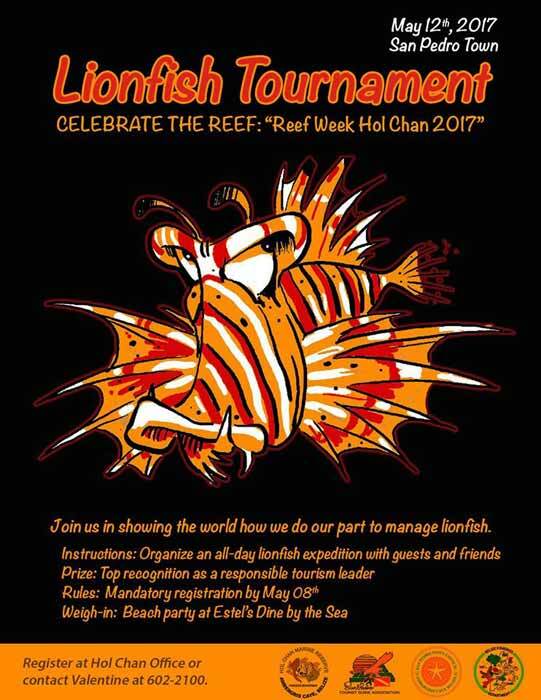 Register Log In AmbergrisCaye.com Home Forums Specials & Events Celebrate the Reef "Reef Week Hol Chan 2017"
It's that time of the year again, where we come together and celebrate the reef, through a week filled of fun and exciting activities!!!! An entire week dedicated to celebrating our reef!! Reef Week will start with the ‘Swim to the Reef Awareness’ on Monday, May 8th at 5:30AM from Amigos del Mar dock. Archer invites as much people as many possible to come out and take part in this memorable activity. “You can swim, or even snorkel all the way to the reef. Take your time to appreciate the beauty of this natural resource that sustains us,” she said. There will be boats along the way in case anyone needs assistance. 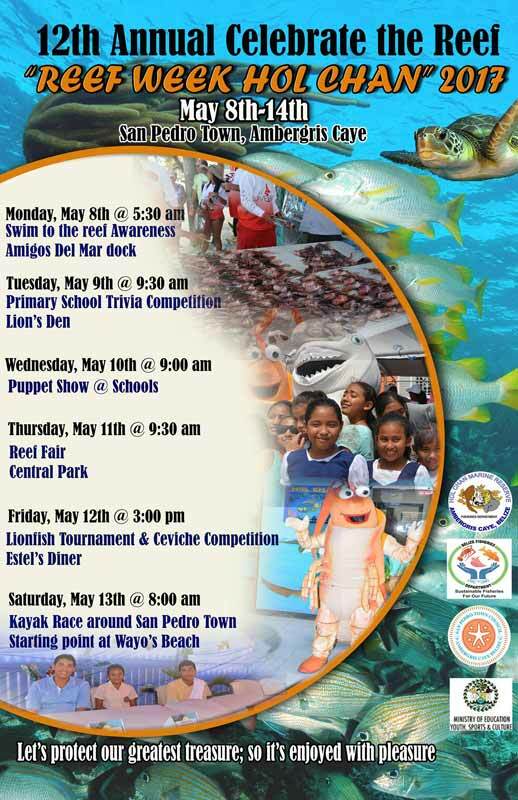 The fun continues on Wednesday, May 10th at 9AM with Puppet Shows at different schools around the island. The presentations will educate the students about managing access to fishing, the rights to fish certain areas, and sustainable fishing. On Thursday, May 11th, activities will continue with the annual Reef Fair starting at 9:30AM at the Central Park. Aside from Hol Chan Marine Reserve, several organizations will be present at the event, with education booths targeting the local populace about the work they do to help protect the reef and the environment. One of the most anticipated events will take place on Friday May 12th when Hol Chan Marine Reserve will host a lionfish tournament at Estel’s Dine by the Sea. In addition, there will also be a lionfish ceviche competition following the weigh-in, and all restaurants are invited to participate. Reef Week will culminate on Saturday, May 13th with a Kayak Race around the island. The race will start at 8AM in front of Wayo’s Beach Bar. The 12th annual Ambergris Caye Reef Week started early on Monday, May 8th, with a 5:30AM swim to the reef. Over the next few days, a variety of events will take place on the island, ranging from educational activities, to a Lionfish Tournament to a Kayak Race, all with the purpose of creating awareness on the preservation of Belize’s marine ecosystem. 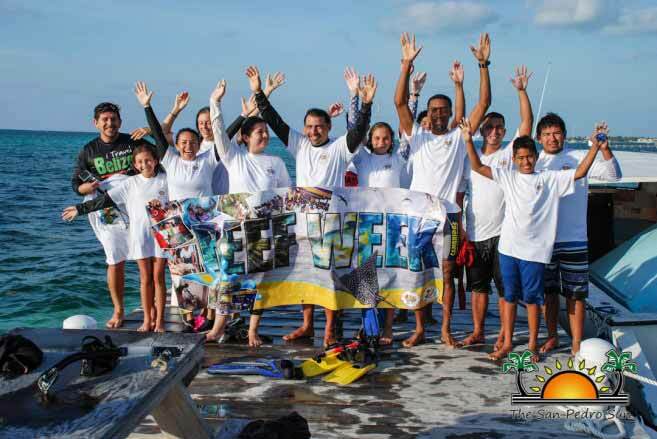 Ambergris Caye’s Reef Week organized by the Hol Chan Marine Reserve kicked off Monday, May 8, 2017, with the Swim to the Reef Awareness, which had participants swimming to the reef from Amigos del Mar Dive Shop. It's Reef Week in San Pedro, Ambergris Caye. We share iTravel Belize's video of Madi's EPIC Adventure as she snorkels/swims through the length of the Belize Barrier Reef to create awareness of its IMPORTANCE to the country. San Pedro's Reef Week, organized by the Hol Chan Marine Reserve, took place last week from May 8 to May 14 under the theme 'Let's Protect our Greatest Treasure; So it's Enjoyed with Pleasure.' It is a week in which the Hol Chan Marine Reserve organizes various activities and events that involve the community to create awareness and knowledge of the reef's importance to Belize. In case you missed any of the events, here is a rundown of Reef Week 2017 in La Isla Bonita. Monday - The Swim to the Reef kicked off the week with participants taking the plunge at Amigos del Mar dive center and swimming to the reef and back during the early morning hours. It's a healthy activity to promote a healthy reef. Highlights of Celebrate the reef "Reef Week Hol Chan 2017"
By Hol Chan Marine Reserve, "Thanks to all participants and our sponsors!!!"